I have been collaborating with artist/activist Lydia Eccles who has introduced me to thinking about climate disruption in a new way. Thought is never just thought, It’s also the bodily state, the feeling, the nerves. It connects with everything else. It’s not merely intellectual activity. And it passes between people. It’s all one process all over the world. ego defenses, to speak truly and spontaneously, opens a free flow of meaning between us. yet he never specifically defined a process. We will create a template based on our 5-session experiment. Thought you might be interested in learning that David Miller, a former member of the Mobius Artists Group, is launching his new (and first!) chapbook, The Afterimages, published by Cervena Barva Press on Saturday, October 4 at 2pm. Building, 191 Highland Avenue, Somerville - room B8 (basement). Mobius friend, Jane Wiley did the cover art. If you cannot make the launch on October 4, perhaps you can see David on October 11.
part of the Mr. Hip Presents series in Jamaica Plain. The UForge Gallery's site is here: http://www.uforgegallery.com/ . photo credit: Variations 8 (by John Cage) at Skowhegan. Produced by David Miller. 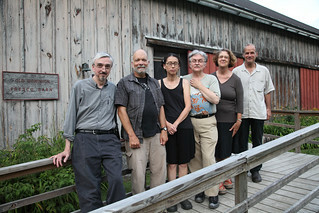 Participating artists include, in this photo, L-R: Bob Raymond, Larry Johnson, Jane Wang, David Miller, Margaret Bellafiore, Jed Speare. At the Skowhegan School of Painting and Scuplture. 8/6/11. Photo by Marilyn Arsem. Mobius/808 Infuse-Yuka Takahashi + Angela Sawyer @ the Fund-Raiser Event - June 14 : 808.Mobius.Infuse. Walking through life, our actions and beliefs are often judged by other people with their own unique perspectives. How much does the fear of being judged influence our own actions and, on the other hand, how does the way we deal with this fear influence the judgment? There is an almost physical quality to the vibe given by judging eyes. Yuka Takahashi and Angela Sawyer work in somatic movement & sound respectively, but they both cross back & forth between conceptual composition and improvisation. Their collaboration blends their separate arts in unique ways. Yuka Takahashi is a dancer, performer, improviser and choreographer currently based in Boston. She is originally from Japan. Her works are highly influenced by conceptual /experimental practice and movement invention. Her experimental approach towards her creations are by actively making an attempt to employ various media and taking advantage of the specific performance site to expand the possibility of presenting the concept from many perspectives without forgetting the existence of the body. At the same time she is interested in taking the audience out of its passive role and actively engage it in the performance. After she received professional training at Joffrey Ballet School, she extended her interest and training in dance and performance art in NYC and Europe. In 2006 she moved to Vienna, Austria. There, she received a residency at D.ID curated by Liz King and she was an artist in residence at the experimental performance LAB called LABfactory for 2 years. At LABfactory she regularly created inter-disciplinary productions with full professional support under the direction of Thomas J. Jelinek and Kazuko Kurosaki. Since she was in Vienna, she has been strongly engaged with artists of other disciplines. Her works and collaboration projects were performed around Europe, Japan and the United States. Since moving to Boston in May 2011 she has presented her own works at Mobius, Boston Center for the Arts, Boston University, Movement Research (NYC), Y Theater at YMCA and OBERON. She produced the experimental performance events 'Living Space' at OBERON (2012) and 'Test Kitchen' at Cambridge Y (2014). After finishing a philosophy degree specialising in Husserlian phenomenology in the mid-1990s, writer and musician Angela Sawyer felt fully prepared to start astonishing audiences around the Boston area using her mouth, some broken electronics, toys & noisemakers. Impromptu squealing & gargling has become her specialty, and she’s released a steady trickle of small-run lps, cds, cdrs & cassettes over the years. She changes the names of her projects to suit her every whim, but longer running ones include Preggy Peggy & the Lazy Babymakers and Duck That. Her 2014 lp release “A Short Visit To The City That Bleeds” is full of weird up-close intimate wordage and environmental activity recorded in and around a rental car parked in Baltimore, MD. Dennis Tyfus from the Ultra Eczema label says Sawyer is “the best living vocal artist”. You can also catch Angela doing stand up comedy around town, & she runs the one & only Weirdo Records from a tiny storefront in Central Square Cambridge. On Sunday (Feb. 9, 2014) Jan Świdziński died. He was a Polish artist, performer, philosopher and art critic. My condolences to his family, and the art community in Poland. On January 19th, 2013 five participants and myself went for a walk in the woods at night just north of Boston. We played a compass game that had each of the participants walking solo through the dark, waiting in the woods for the whistle, and then returning. This was repeated three times, with each wait becoming longer and longer; the first interval lasted approximately 1 minute, the second interval was 5 minutes, and the last interval lasted 20 minutes. During the time in the woods participants meditated on the following koans. We then sat on the floor of the Oak Grove T-station (which was closed for construction) and engaged in dialogue. The discussion started with how the compass game in the dark could relate to the koans, and how any of the experiences or thoughts had in the woods could relate to daily life. From there the conversation "drifted" to various things, including sharing childhood memories. The project was designed to indirectly analyze our society and culture through a camouflaged look at our daily patterns. Note: I intentionally do not include documentation of the dialogue as there is no way to represent the experiences had by the participants. As James Turrell says of his work, this is a "non-vicarious art". Unlike with reality TV, you can't have a secondary experience by listening in on the conversations that happened in the subway stop in Melrose.